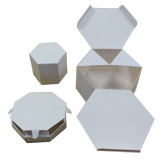 The straight tuck end box or STE box is a very standard and common box style in industrial packaging. 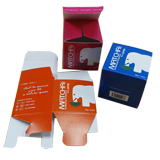 This type of carton box allows for quick assembly and many variations in how a product is positioned. In the Straight Tuck End box, both top and bottom closure panels tuck in to close, and they can be tucked from the back to the front or other way from the front to the back. 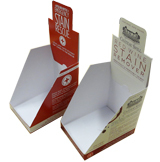 A custom die cut shape window can be added in the front display panel so the products can be seen without open the box. The Straight Tuck End box is used popularly in most product industries, such as beverage boxes, cosmetic boxes, food boxes, medical boxes, pharmaceutical boxes, retail boxes, software boxes, toy boxes and much more. Custom printed STE – straight tuck end box style, custom box size and shape with full color process printing are available upon of your request. Please contact us for Free Straight Tuck End box style design template.